Astragalus plant, Astragalus membranaceus, is used widely to assist in the recuperation from debilitating illness. Is regarded by some as the King of Chinese Tonic Herbs, improving the function of the liver, spleen and lungs. It is also said to protect the body from the side effects of chemotherapy. Astragalus is also known as Huang Qi, Kampo and Chinese Milk Vetch Native to China and Eastern Asia, Astragalus plant is adaptable to most soils with good drainage and in a position with full sun. Very slow growing. Drought and frost tolerant. 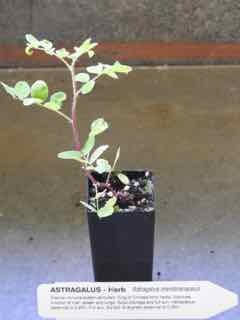 Herbaceous perennial plant, growing to about 0.45m x 0.2m. Be the first to review “Astragalus, plant” Click here to cancel reply.